Helen Thompson Taylor was recovering from a serious car accident at Kendal’s Stephens Care Center when there was a knock on the door. A retired music teacher and avid volunteer in all matters musical, Helen had not played the piano in weeks because of her injuries. At the door was a Kendal couple, with a portable electric piano and Bach and Schubert sheet music. “The moment they left I sat down and played. Then I played Broadway hits for three hours. Absolutely, it helped me heal,” Helen says. Clinical psychologist Michael Friedman writes in Psychology Today that music is especially powerful in easing emotional pain. “We now know through controlled treatment outcome studies that listening to and playing music is a potent treatment for mental health issues. Research demonstrates that adding music therapy to treatment improves symptoms and social functioning among schizophrenics. Further, music therapy has demonstrated efficacy as an independent treatment for reducing depression, anxiety and chronic pain,” he writes. Jara Dell, music therapist at Kendal, says a music therapy activity has several goals. “In general, we want to maintain a quality of life using music. Music therapy helps residents socialize with others, work on different motor skills, distract from pain or sadness, or get exercise in disguise. “For example, we have some groups where I will perform live music while an assistant will help residents hit a balloon around to the beat. Other times, we’ll bring out a parachute, beanbags, or streamers. The items we use are more tactile; they’re something residents can actually maneuver. Props make a session more fun, and they get residents moving,” Jara says. Several months after Jean Slonneger moved to Kendal, she put the word out that she was looking for people interested in playing the recorder. Now she has six dedicated players who meet twice a month, sometimes more often, to play Baroque and Renaissance music, and learn more about the wind instrument. “We’re all having so much fun. 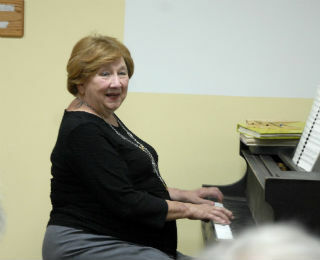 One of the women said the best thing is that it gives her a connection to her grandchildren” who also play the instrument, Jean says. 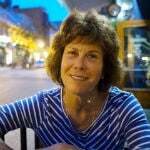 Helen has resumed her busy schedule, volunteering with public school choral students and others. Once a week she sits down at the piano in the care center and plays hit songs from the 20s, 30s and 40s like “A Nightingale Sang in Berkeley Square.” The three dozen men and women gathered around her don’t need song sheets – they know all the words. “They come alive, they really come alive. Even those who are sleepy are hearing something,” she says.